What is the value of a patent? The truth of the matter is that most patents are worthless. What? How can that be with so many people suing over these patents? 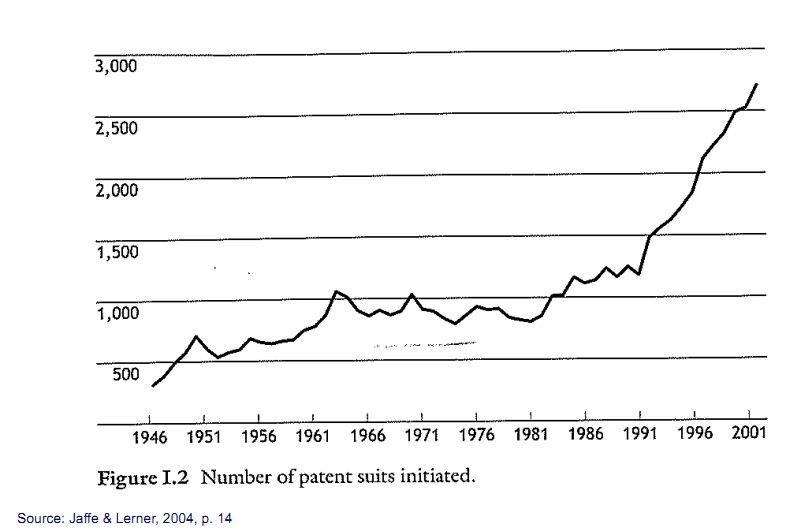 Why has there been a HUGE increase in patent activity in the past few years? Just because something is worthless doesn’t mean it can’t be useful. However, that being said, most patents are still useless. A patent on how to swing some one in a swing, is in fact, worthless and useless (real patent) (Jaffe and Lerner, 2006). In fact, I would argue it has negative value as it cost substantial money to have it patented. Granted the father was the patent attorney, however, there are still expenses that has to do with the procedures to get it patented. In 2008 a study was published on the values of patents based on a survey asking both inventors and managers what they felt the value of a patent would be. As can be see in the figure below it’s a greatly skewed graph with the vast majority of the patents being worth less than €1 Million ($1.5 Million). This value is related to how much an inventor or manager would have sold the patent for as soon as it was issued. But wait! That’s not worthless. In fact that’s worth a lot of money! Is it? For a person yes. For a company maybe not. R&D is not cheap. Let’s say it took three years to develop the technology and a staff of 5 people making €50,000, that alone is a cost of €750,000. You’d barely recoup the expenses of that let alone the materials. However, most economists would argue that those costs are sunk and shouldn’t be factored into the cost of the patent. I do agree with this assessment, however there are other costs to consider as well. One of the biggest costs is risk of lawsuits. Which as you can see below are growing at an alarming rate. In a lot of ways, patents are worthless until you sue someone. There are arguments that a patent has no value until you try to actually use it, or prevent some one from using it. Thus, the fact you’re suing means it has inherent worth. Additionally, as there are requirements to pay for patents, a certain fee each year, there is a certain bottom level threshold to indicate the value of a patent. Shifts in this value will impact different patent holders differently. Increasing it towards the end could drive up litigation, while decreasing it, means that no patents will lapse. European patents. European Management Review (2008) 5, 69–84. This entry was posted in Culture, Economics, Politics and tagged Economics, Innovation, Knowledge, Patents. Bookmark the permalink.